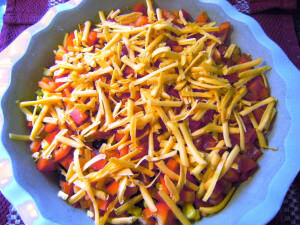 Layered taco dip is one of those easy appetizers that get gobbled up first at parties. 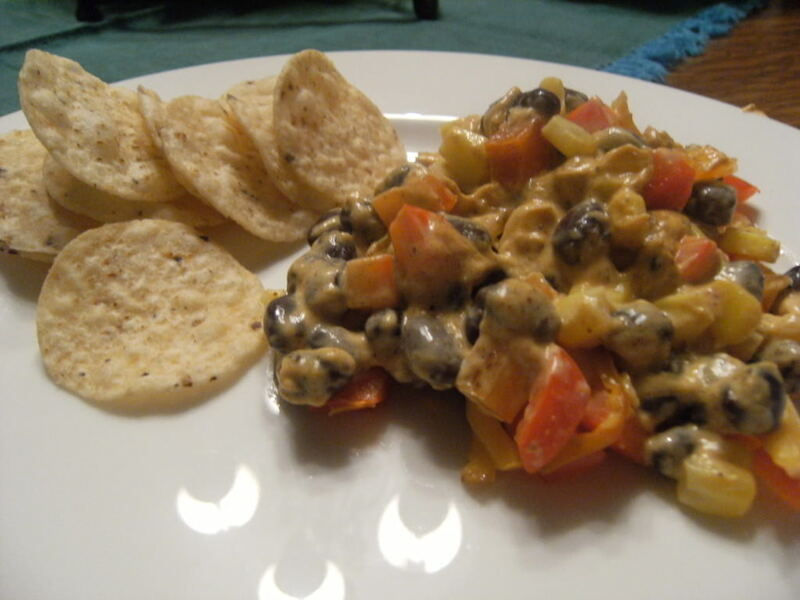 With healthy ingredients like corn, black beans, bell peppers, and tomatoes, it’s as wholesome as it is delicious! As a new mother, I had the privilege to meet a great group of ladies through a local Mom’s Club. We were all newer moms at the time, so it was really nice to have the fellowship and camaraderie during a time of great change. Motherhood is such a wonderful blessing. But initially, the life change can be a shock to the system. It was great to have a group of girls to share the journey. We started book clubs, cooking clubs, and knitting clubs. We worked out together, and had tons of play dates. One of the nice things club members did on occasion was to bring a week of meals to any member in need of a little extra support due to a life experience: birth of a child, death of a relative, husband away for an extended period of time, etc. When we were blessed with son #2, my friend Holly offered to bring us dinner. I was really excited because I had just delivered my second baby, and I was in desperate need of grown-up conversation that didn’t revolve around spit up or how many messy diapers I’d changed that day. And I love Holly. She came by and delivered a handmade satin sleep mask, and this layered taco dip. I’ve never been much of a fan of taco dips because of their propensity to contain sour cream. Yep, I admit it. I don’t like sour cream. That pretty much makes me an anomaly in my family. I politely passed on any taco dip that came my way to avoid any remote chance of ingesting sour cream. A girl can’t be too careful about these things. I’ve been thinking about Holly lately, so I had to make her layered taco dip. And let me tell you how proud I was that all of my boys at it. All of them. The baby tossed his spoon aside and ate it by the fist-full. It’s fabulous. Cream together the softened cream cheese and taco seasoning, then spread it into the bottom of a deep dish pie plate. Now for the fun part–the layering! Spread the black beans over the cream cheese mixture. Then the corn. I know corn sounds a bit weird in a dip, but trust me on this one. 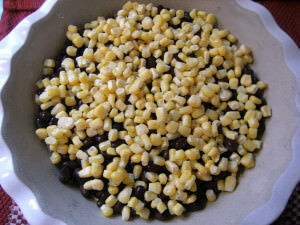 Corn and black beans are made for each other. 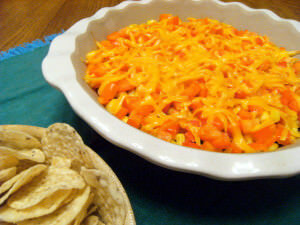 I like the color and sweet crunch that the diced red bell pepper adds to the dip. Spread it over the corn & black beans. Last but certainly not least, sprinkle on the shredded cheddar. I’ve said it before, and I’ll say it again: please grate your own cheese. Thank you. Bake the taco dip at 350 degrees for 20-25 minutes, or until it’s heated through and the cheddar has nicely melted. Then scoop it up! And don’t feel the least bit guilty–there’s good stuff in there! Feel free to add other good stuff like black olives, tomatoes, or green onions. Whatever works for you is fine by me! Just be sure to serve the sour cream on the side. 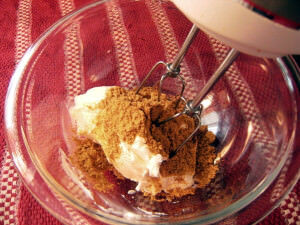 In a small bowl, mix softened cream cheese with taco seasoning until blended. Spread cream cheese mixture into the bottom of a 9-inch pie plate. Sprinkle black beans on top of cream cheese mixture. 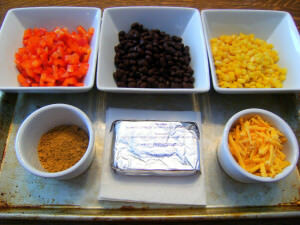 Layer corn over top of the black beans. Spread the red pepper over top of the corn layer. Sprinkle the cheddar cheese over everything. Bake at 350 degrees for 20-25 minutes, or until warmed through and cheddar is melted. To eat, scoop with tortilla chips, or spoon into tortillas. 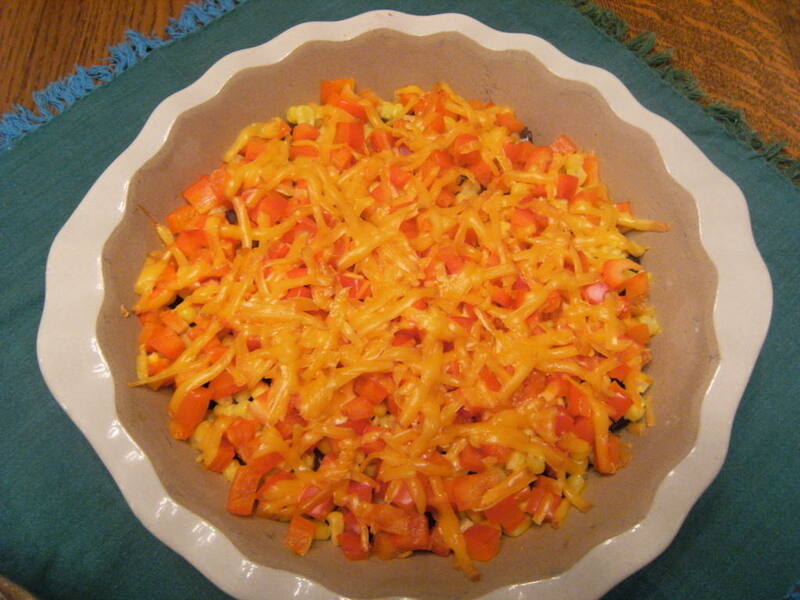 FUN new twist to the layered taco dip. I LOVE sour cream, but it hates me ... dairy allergy. So this is a new one for us to try. I think I will add some goat cheese in with the black beans and put some avocado in there too! Thanks for sharing!! Oooo! I think avocado and goat cheese would be divine! This looks delicious -- and I like sour cream! There's nothing like the dear friends who look after us when we need food and sustenance. 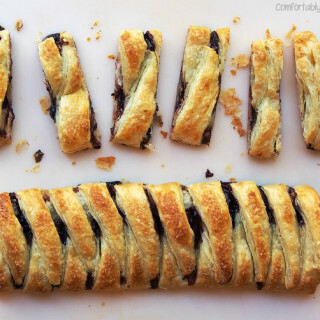 Wow, that looks delish! I, too, am an enemy of sour cream. And cottage cheese. Blech. Cathy B., I think that makes you cool, because that is precisely how I ate it! 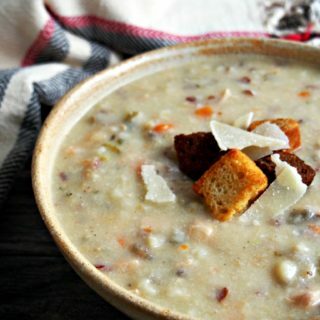 Despite my love of sour cream ;-) this does look tasty and how can I resist when it is packed with all kinds of great vegges covered in my favorite CHEESE! Can't wait to try it. This looks gorgeous. I am a sucker for Mexican/Tex-Mex food.